It has taken a long time for me to write you an update. 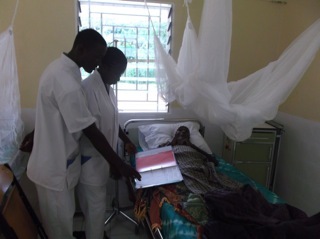 I am working in the clinic, attending to patients as well as doing a lot of bedside teaching. Most nurses are qualified nurses, but the quality of the training is not up to the standard, as I would like it. Also some have forgotten things. Therefore a lot of teaching needs to be done: now with a every Friday quiz – having some fun as well. As I have noticed a big need for proper (basic) orthopedic care, I have started to provide, even though our equipment is far from what is required to do a good job. 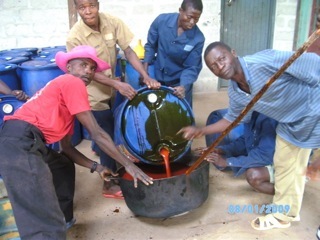 But even without better equipment, we can provide some treatment better then the herbalists. 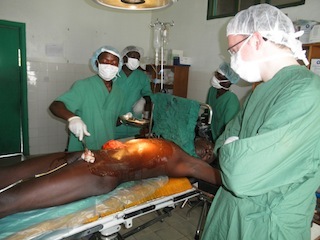 Most other hospitals do not do any orthopedics, only refer to Emergency Hospital in Freetown (good Italian run hospital, but now unable to cater for the whole country, so almost always full, so often they can not accept new patients). One of my patients is Isatu. On the 27th of January she was involved in a car accident: she was a passenger and the car drove into a tree. When she came she was in severe pain around her waist, so much that she did not even complain about her arm that was broken too. 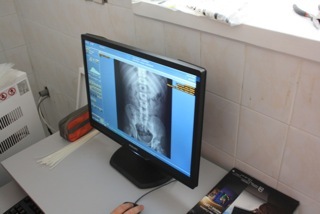 As we do not have X-ray and clinically i could not assess the problem well enough. 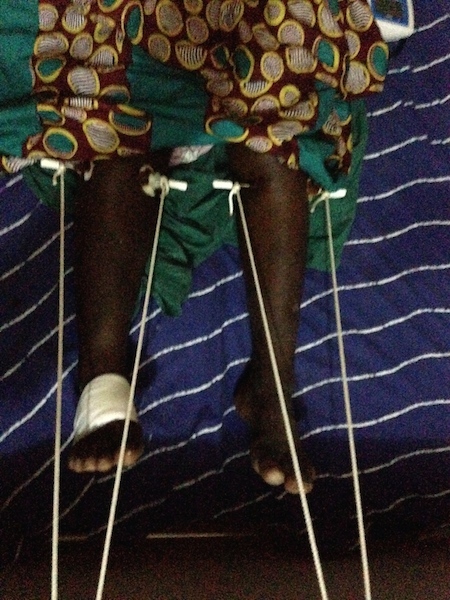 We contacted the Government Hospital in Makeni, were we could come for X-ray, despite the late hour. 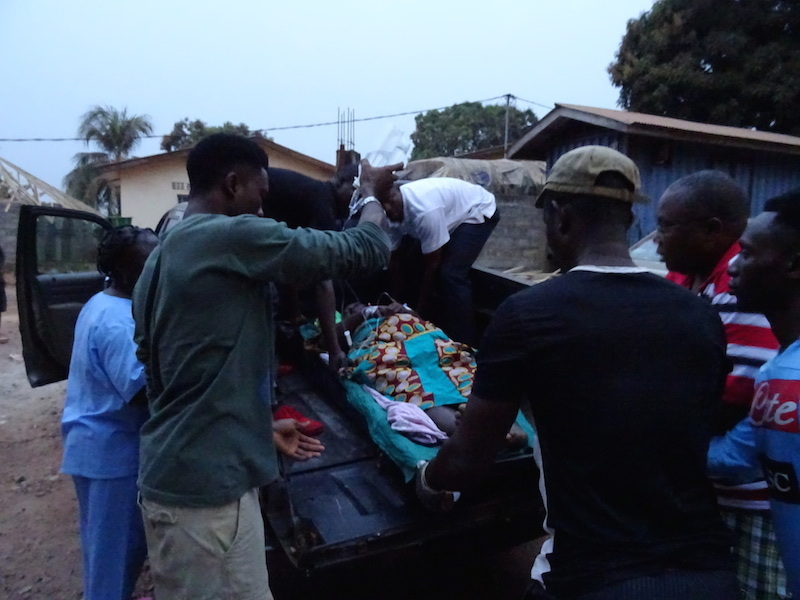 We put Isatu in the back of the pick-up of dr ABD and went to the government hospital. This is not far, but part of it is over bumpy dirt roads – very painful, despite the pain medication we gave her. Her left hip was broken in the pelvis (acetabulum fracture) and the right hip was broken in the upper part of the upper leg (pertrochanter fracture). These are severe fractures. The day she was released from the traction, she was sitting outside, but her face told me she was not happy. She was sad, as she disappointed her relatives, as she did not walk immediately. I explained (again) to her: those are wrong expectations, it will go slowly. Soon she had her optimism back and started practicing. 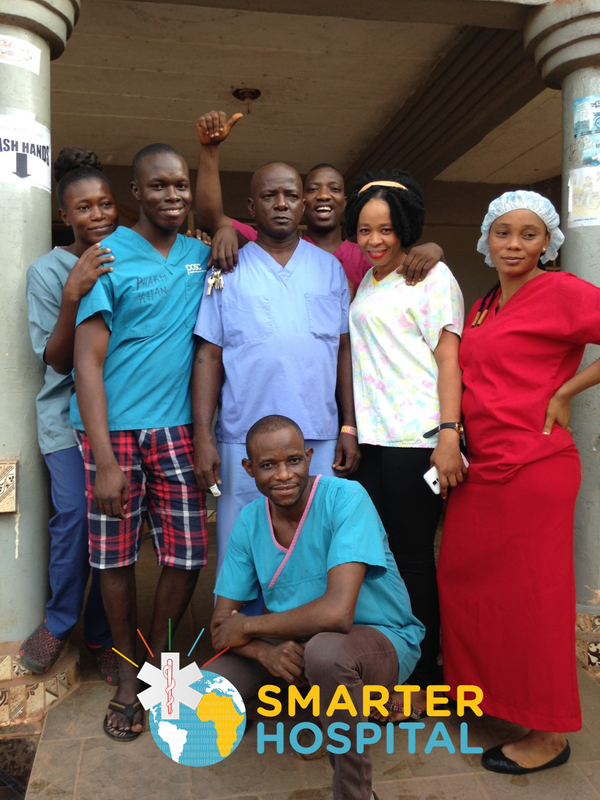 The website of Smarter Hospital has been renewed, with updated information! The last updates on teach-the-teacher project are really positive! City Garden Clinic now has its own website, with much information about the clinic: the history, the staff, news updates, and much more. 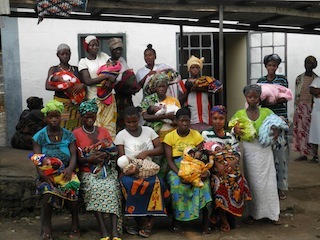 Also two projects are on the website: the VIA – cervical cancer screening and the uniform project. More projects will follow, so keep checking the website! Like every year Mr Rudi is joining the Nijmeegse 4 daagse (four days of walking). He is training very well. I hope to keep you updated a bit more frequently, but now you can also always check the website (where I will regularly post news updates). It is Thursday, the 4th day our new ward for inpatient is open. We have only one patient who gets much attention and care of our nursing staff. 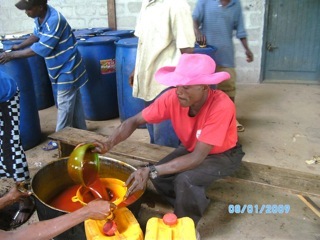 Mr Yankuba Sesay (CHO) is running the OPD and I am passing by our neighbours, the NedOil palm oil factory, to arrange for a combined trip to Makeni. While taking to Maria Singo, the manager of NedOil, one of the nursing aid from OPD stands in the door opening: there is an emergency. I follow her to the OPD. On the bed a body of a young boy, the CHO is assisting his breathing as his own is very irregular. Immediately I ask the nursing aids to assist me putting up an IV canula, fortunately successful. We give him D50% (sterile sugar water) through the iv and quite quickly he start breathing better, more regular. He is still very weak and sick. We start other medication and admit him. 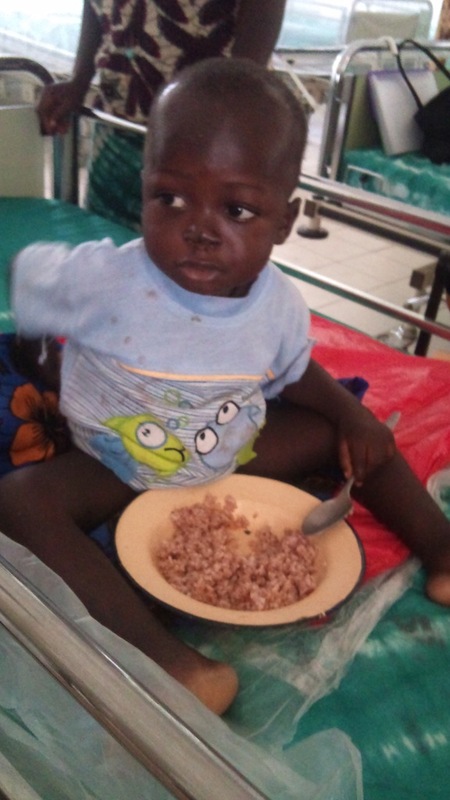 (I am so very happy this time I do not have to send him in this condition to another hospital, where they might never reach due to transport/money or family problems). Also he gets much attention from our nurses and his very concerned father. In the following days he really improves a lot. He starts eating well, all by himself. We can send him home on balance medicine. Via other locals I hear that people on the way to the hospital had said to turn around, as the boy can not make it up, but the father insisted in coming to the hospital. I know he is happy that he did. I wish these children were brought earlier, but a child can get sick quite quickly, and for many people a hospital is very far (by foot). This is where Lion Heart Medical Centre will make a difference, as before these people had to travel to Makeni (75km) or Masanga (60km) for a hospital. Then the boy would not have made it. on 25 July 2012 . Omdat je er nooit 100% klaar voor bent en we een keer moeten starten, zijn de verpleegkundigen begonnen met hun intake gesprekken deze maandag. Dus in plaats van dat iedereen aanwezig is om 8 uur in de ochtend, waren er alleen de normale OPD personeel en Beatrice.. Zij waren de eerste ochtendploeg voor de afdeling. Geen van de patiënten te verzorgen, maar men zou kunnen komen van OPD indien nodig voor opname. Dus maakten ze zeker dat ze klaar waren en gereinigd de afdeling nog een keer. Op 2.30 van de late shift kwam: Abdulai en Isha. Het was bijna 6 uur toen ik het ziekenhuis verliet met de gedachte: “Zelfs als er geen patiënten zijn , is nog steeds een goede om te wennen aan verschuivingen en naar de afdeling”. Maar, tijdens het eten werd ik gebeld door Abdulai: er was een nieuwe patiënt, heel ziek. Hij probeerde om de vitale functies te nemen, maar er was geen BP machine op de afdeling nog niet. Snel afwerking diner en samen met Maria Singo ging ik naar het ziekenhuis. Een oudere man lag daar in de onderzoekskamer, zwak en met koorts. Ik verzamelde de BP machine en extra papieren van de OPD, dus konden we de patiënt toe te laten. We begonnen met een infuus en andere medicatie, verzameld uit de apotheek. Onze eerste toelating is een feit! In de tussentijd de nachtploeg, Janet en Osman was aangekomen. Ze kregen er een overdracht – Abdulai begint onze overdracht met het schrijven in het boek. Osman en Janet blijven verantwoordelijk voor de afdeling. Om middernacht maakte ik een extra controle, maar alles ging goed: het infuus liep en de patiënt sliep. Met instructies en een telefoon om mij te bellen met een probleem dat ik vertrokken ze weer. Het is nog een lange weg voor een goed lopende ziekenhuis en we moeten iedereen de steun om er te komen, maar vandaag heb ik echt het gevoel deel uit te maken van de echte start van iets goeds. Het lijkt erop dat de verpleegkundigen hetzelfde gevoel hebben , ze zijn zo enthousiast om te werken en te leren. on 06 May 2012 . 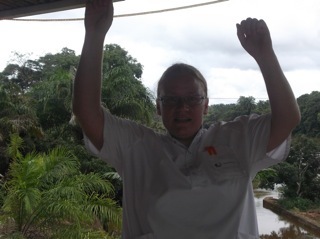 Met enige vertraging (vlucht gemist) zijn de monteurs van Medex uit Ghana aangekomen. Don Keus heeft met hulp van Frank, Hans en Co de laatste hand gelegd aan de elektriciteit aansluitingen. Hij heeft kisten uit de container gehaald, klaar voor uitpakken. Edward en James uit Ghana kunnen direct aan de slag. 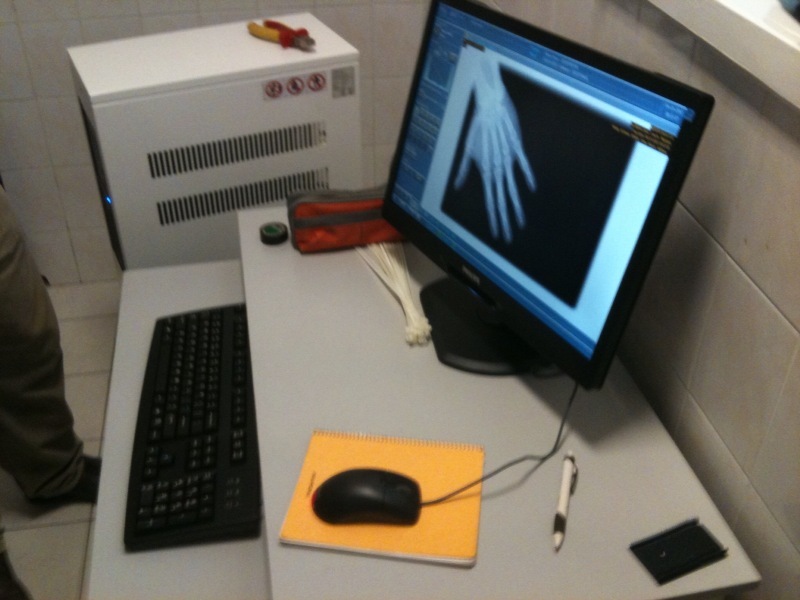 Grote zware apparatuur wordt uitgepakt en in de X-ray ruimte gemonteerd. Vele snoertjes en kabels krijgen de juiste plek en aan het einde van de dag kan de eerste röntgen opname gemaakt worden! Het apparaat van DigiMedX doet het goed! Op zaterdag, de kliniek is dan gesloten, hebben Maria, Ellie (lab technician en aankomend rontgenlaborant) en dokter Erdi de hele dag de tijd om te leren goede foto’s te maken. Vele mensen fungeren graag als proefpersoon (wilde altijd al weten of die pijn iets met het skelet te maken heeft). Kleine instellingsproblemen kunnen direct door de specialisten verholpen worden. on 10 March 2012 . It is Friday afternoon. 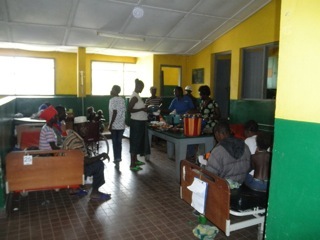 The morning has been quite busy at the clinic, 22 patients. Especially since Maria has been teaching our nursing auxiliary class most of the morning. So besides being the doctor that does the consultations (the CHO is out due to family issues, said he would be back today, but not seen yet), I also covered the pharmacy. Luckily Morlai, our nursing aid was there to help me! 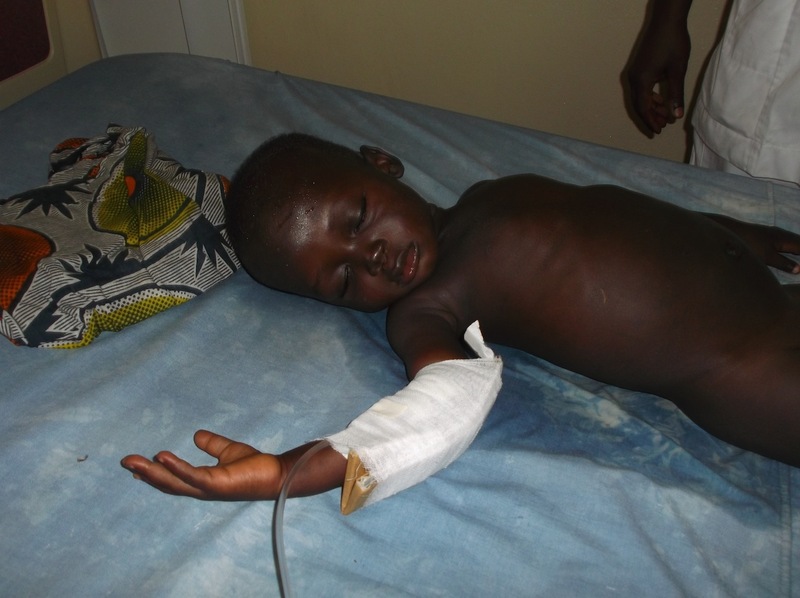 A father comes in with his 5-year-old son, Amadu. The boy was playing with a small piece of a toy, like a small rubber. He was trying to whistle with it, when it suddenly got in his throat. He had been coughing. It just happened this afternoon. The boy is sitting next to his father and we are able to take his vital sings. He coughs once or twice. When I check his lungs, they are clear. We are hoping it is stuck in his oesophagus, so Maria gives him some biscuits and water. After observing him for some time, he seems to be fine. His mother, who is one of the nursing auxiliary students, comes out of the class, as the lesson has finished. The whole family goes home, with instruction (if cough continues or fever come, do come back). On Monday Amadu and his father come back. He is coughing a lot and sometime makes a whistling sound when breathing. When I check him I confirm what the father tells me. That means the rubber went to his lungs. It can course a lot of problems there, and is difficult to get out. Under anaesthesia I do give it a try, but I do not see the rubber. But this makes him cough even more, unfortunately not coughing up the rubber ☹. I contact the bigger hospitals in the capital city (Children’s hospital and Emergency hospital, but neither have a bronchoscope), maybe the government hospital in Freetown. So I tell them to go there tomorrow and write a small note. When he is fully awake, the classes are over and Amadu and his parents go home. We clean up the last things in the hospital, when a motorbike comes. It is Amadu’s father. 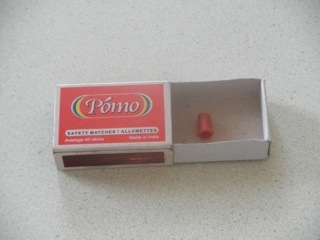 With a big smile he shows a matches box with in it…. The rubber. At home Amadu coughed again after drinking and it came out. He will be fine! De beste wensen voor 2012! on 01 January 2012 . Allereerst over een patiënt die zwanger was, maar de buik niet goed mee groeide en erg veel buikpijn had. Met de echo gekeken en daaruit bleek dat ze een buitenbaarmoederlijk zwangerschap had die gebarsten was en bloedde in de buik. (Een normale zwangerschap nestelt zich in de baarmoeder, die zeer goed in staat is mee te groeien en voeding aan de foetus te leveren, een buiten baarmoederlijke zwangerschap nestelt zich elders in de buik, vaak in de eileider, die niet geschikt is om mee te groeien. Wanneer de foetus dan toch groeit, barst de eileider en gaat (veel) bloeden in de buik). Dit hebben we uitgelegd aan de vrouw en haar man en verteld dat ze een operatie nodig had. Ze leken dit te hebben begrepen, maar weigerde de operatie even later. Ook haar man weigerde, hij was bang voor zijn schoonfamilie en de vrouw zelf was ook bang. Ze komen uit een dorp nog verder in de middle-of-nowhere dan Masanga. Na veel praten wilden ze het advies van de nursing aid die hen als eerst had ontvangen in het ziekenhuis. Hij kwam en probeerde hen gerust te stellen, dat leek te werken, maar later toch weer twijfels. Ik wilde het bijna opgeven, omdat ik zonder hun toestemming niet kan opereren (nee, ook hier niet! ), maar zonder operatie zou ze kunnen dood bloeden..
Na nog meer pogingen lukte het om hen te overtuigen. Gelukkig! Met dr Alex en de STP (Surgigal Training Program= HBO-artsen in chirurgisch training) haar toch nog diezelfde avond geopereerd. Bijna 3 unit bloed uit haar buik kunnen terug geven en de bloeding kunnen stoppen. Na de operatie knapte ze goed op en was ze erg dankbaar. Ook de nursing aid, die geen familie was, bleef erg betrokken bij deze patient en was blij dat ze het zo goed deed. Tja, als je in een dorp woont ver weg van alles, lagere school waarschijnlijk niet afgemaakt, een rivier hebt waar je water vandaan komt, woont in een hut, ect. Dan kan ik me wel voorstellen dat wanneer een blanke dokter zegt dat de zwangerschap in je buik niet goed is en je geopereerd moet worden, dat wel erg eng is…. Toch goed dat ze wel naar het ziekenhuis gekomen is. Er is hier nog veel verbetering mogelijk, zelfs met simpele dingen als mensen leren lezen en schrijven. on 27 November 2011 . As you might know I am working in Masanga Hospital since the beginning of this month. Masanga Hospital has about 105 beds, divided over a surgical ward, male and female side (but here also the medical cases are being admitted), paediatric ward, stabilisation centre (for malnourished children), and a maternity ward (were also the waiting mothers are staying). 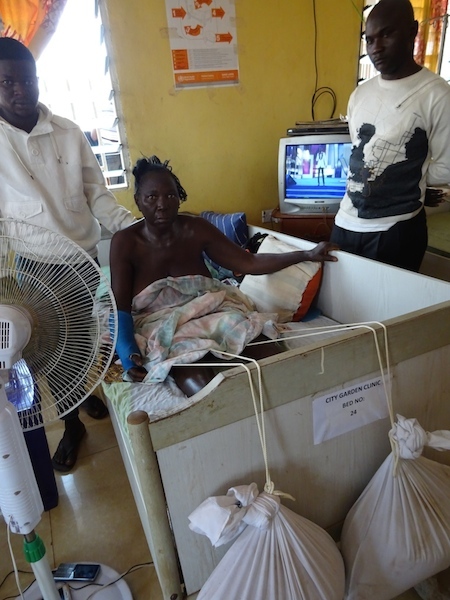 There is an OPD, under-five clinic with antenatal care, a laboratory, dispensary/pharmacy, X-ray department and …. of course a theatre. 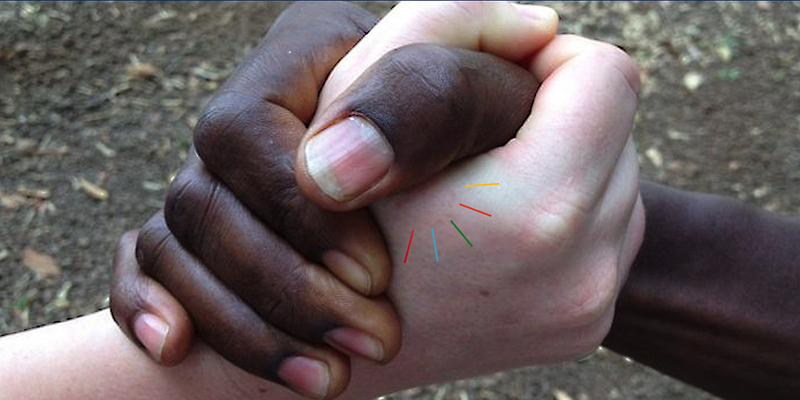 I would like to try to send you a short story from Africa once in a while. Just before I left Makeni, the bigger town, I wanted to convert my driver licence into a Sierra Leonean one. I was lucky as one of the drivers of Magbenteh could join me, as I did not know exactly where the road traffic department is. We drove into the road and asked, as the driver was also not sure. Some men under a tree were friendly and pointed out that it was just a little further down the road. There we found it, but there were several offices, most closed. After being directed to the road traffic office, I was told by the young men that the officer (in change of the driver’s licences) is out, so I should come back later. When I told the driver that he told me that that officer is the one that showed us the way… So we went back to the tree and explained what we came for and then the man would come with us. As I had inquired before I had all the required items (passport picture, copy of driver licence and passport with work permit and of course money) An other person to write me the receipt was not there, so I had to come back later for the receipt. After about 10 days I can collect my drivers licence. This actually went quite smooth. The next day they were closed before I could come for my receipt, but on Monday I got it. Now I am in Masanga and did not have a change to collect my drivers’ licence, but it should be there, and I have the receipt! 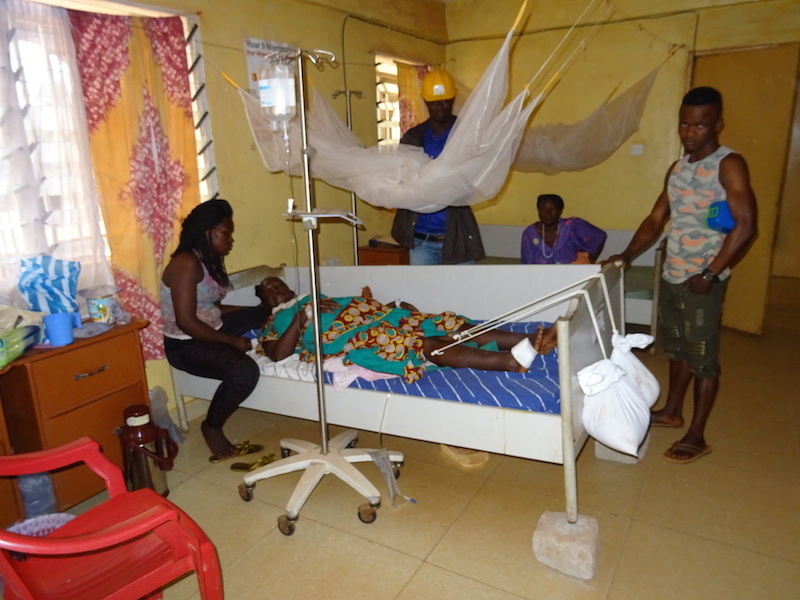 This week we (all clinicians) were in the conference room for morning handover, when we heard a motorbike drive up the hospital compound, nothing unusual, but just after that there was quite some noise from the direction of the ward. 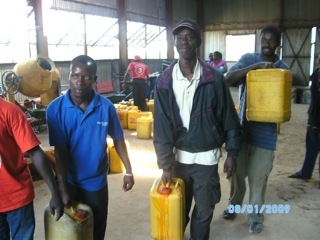 From were we were we could not see what was the problem, so one of us, dr Thomas Asley went to see. Not much later an other 2 motorbikes came with even more noise. All of us went there to assist. It had been a frontal collision of two motorbikes (each carrying 4 people), so we had 8 casualties. 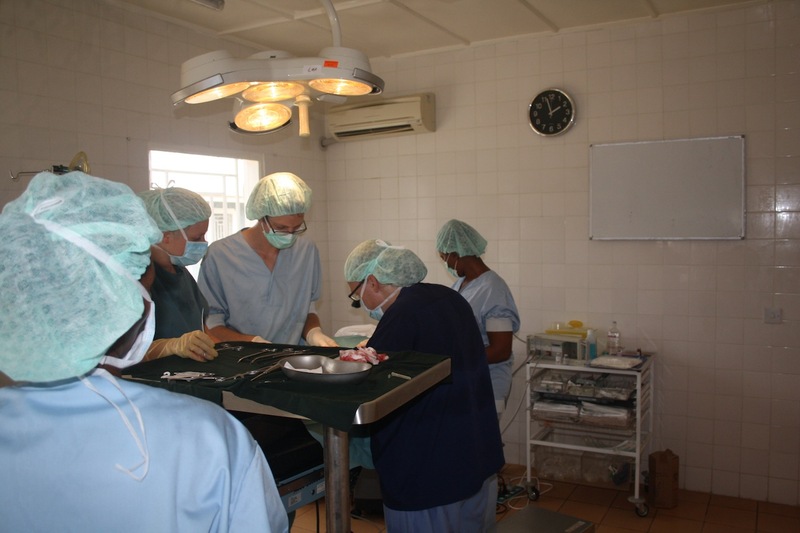 The ward is very full, so that would not work well, so immediately we (dr Alex and me) decided to get all of then in the ward for the stabilisation centre (were we had enough empty beds). That showed to be a wise decision as now also we could keep a very large crowd of curious people out. 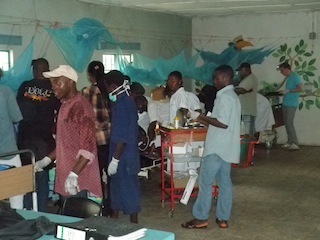 All present staff assisted: they were assessing patients, making chards, suturing cut wounds and giving painkillers. It seemed no one was wearing a helmet and 3 of then had a brain contusion: “what happen?” one repeated about every minute, despite the fact that he was told. Even though it is not according to Western standards, I think every one did a quite good job. I hope the plans for an emergency room (renovation of the part of the hospital near the entrance of the hospital and next to the X-ray) will be realised. That, together with some more training/practise, will make the trauma care to be fairly good. Oke, enough stories for today, hope to write some more later.